For years you’ve been tracking Skelit's Revenge, the most notorious ship on the high seas, and now you’ve finally taken it. Your Captain has informed you that there are treasure chests hidden on board full of the most valuable treasure the world has ever seen. In spite of the raging inferno aboard the ship, your captain orders you and the rest of his crew to bring him every single one of those treasure chests or you’ll be taking a long walk off a short plank. You and your crew will enter and search the Skelit's Revenge in an attempt to loot all of the Treasure. But beware, there are still enemy pirates lurking, and some nasty guards looking to make sure you don’t get out alive. Not to mention that you’ll be doing this while the ship burns. You’ll have to battle the flames, the guards, and your own fatigue. 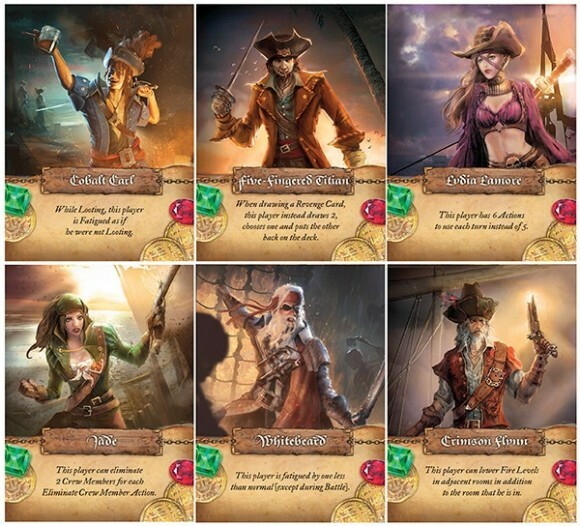 Dead Men Tell No Tales is a cooperative game where players take on the role of a Pirate crew, boarding the doomed Skelit's Revenge for one purpose: to take the loot. You need to deal with the spreading fire and explosion potential as well as the enemies left on the ship. But what's a little risk for the plunder! Each round you flip over a new tile to add to the ship and you also flip a card to show where the Skeleton Crew advances. You may then take a number of actions and use shared equipment to deal with the fire, your own fatigue, the trapdoors and guards on the ship. 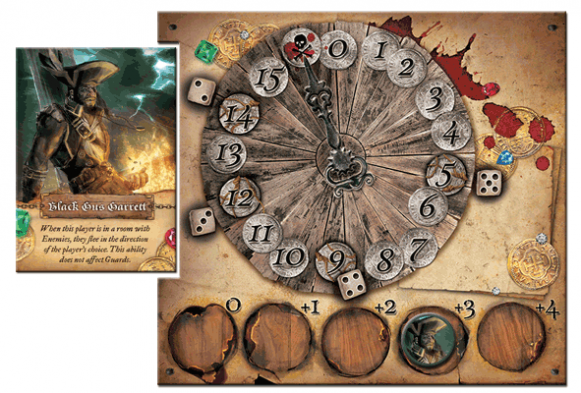 In Dead Men Tell No Tales you can even pass some of your action tokens to the person to your left in case they need extra help this round. Simple to resolve combat feels engaging without taking more than a quick die roll. You will be constantly gaining fatigue and you must manage your ability to keep going. Does this game have a ghost pirate ship exploding on the box? How do we play?! You are a team of pirates who has just boarded a ghost pirate ship full of loot. Your goal is to escape with all of the loot alive. In order to do this you need to explore the ship, fight fires, dispatch of crew members, manage player fatigue, battle with ghost pirates and use your different player abilities to give you a slight edge. I suggest watching a video play through if this sounds interesting! -Mechanics all make sense with the theme and game. -Battle system is basically rolling the dice and hoping for a high number, with some manipulation. -Starting board can’t be flipped when exploded, not a huge deal but kinda annoying. -Alpha player, but no worse than any co op game. -Lots of things to do and lots of pieces make the game a little fiddly and easy to forget a step the first few times. I had really high hopes for this game, and it delivered on a few fronts. The art and theme tie in are about as good as you can get for a game. The materials are great, and each mechanic works and makes sense for the game. For some reason it didn’t live up to the expectations. All of the mechanics are mechanics that I enjoy from other games- but when put together it all got kind of muddled for me. The battle system was a little anticlimactic for me, but I’m not sure how I would improve. There is a lot that happens each turn, which can be good or bad. The board can greatly change from one turn to the next, so you are frequently just reacting to problems instead of being able to plan and be proactive. All in all it is a game I would recommend people try out if you are a fan of co ops. Who doesn’t love plundering a pirate ship while it’s burning and the ghost of the dead pirate Captain and his henchmen try to kill you! The theme is furthered with the artwork on the modular tiles and the character sheets as well as the items you can use throughout the game. The second aspect of the game that perked my interest were the mechanics. There are a number of them that are unique with some common ones thrown in as well. 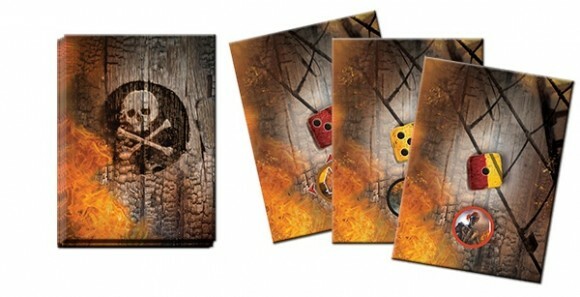 The board (pirate ship) is represented by randomly drawn modular tiles that play against a frame (ships hull) Modular boards are not unique, but what is unique about these is that each one has a “fire” level indicated on it by a colored square in the center. You then roll either a red or yellow D6(depending on the color of the square on the tile) to determine the fire level of that room. The fire level can have many effects. It can effect the “fatigue of the pirate trying to cross through it (more on this in a minute!) 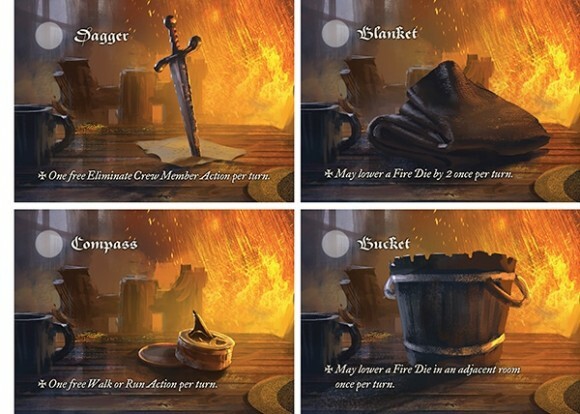 it can also cause casks of gunpowder to explode effectively closing surrounding rooms and destroying treasure around that room. 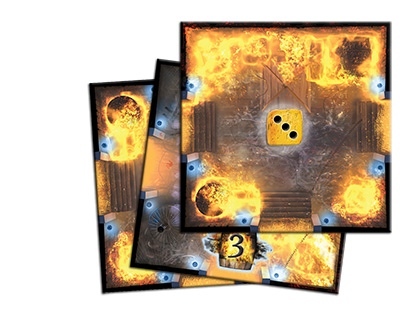 There are cards that are drawn that can cause the fire level in a room to rise. These cards will have an image of a yellow or red square on them and that require you to raise the level in any room by one if they have the indicated colored die in them. A character must be able to board and leave the ship with treasure without becoming “fatigued”. To track your fatigue each player has counter (looks like a clockface) with an arrow to indicate your fatigue level. Moving through rooms that are on fire requires you to lose fatigue. you can also opt to run, but that costs twice the amount of fatigue. Fatigue is also spent carrying treasure off the ship. Once you have gained treasure you can only walk and the burden caused more fatigue to be lost. Over all I like this game. It has a fun theme and some unique mechanics, but it doesn’t seem to hit our table all that often. I thinks its primarily because it can be a bit fiddley dealing with the fatigue counter which is an important part of the strategy and planning for the players. 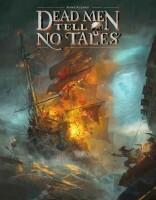 If you are into co-op games where people play to win with you but not to be told what to do than Dead Men Tell no Tales will allow you to do just that. While there is collaboration there is also the fact you will be by yourself fighting dead pirates and you can decide on how and when you will do it. I enjoy it and every time I think I have won or am going to win something will come out of nowhere and take victory away from us. Fun theme and an engaging game. Add a Review for "Dead Men Tell No Tales"